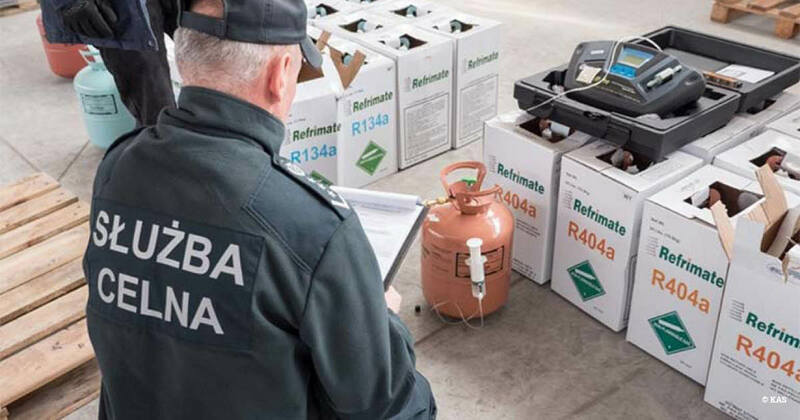 Polish authorities have seized nearly 25 tonnes of illegal hydrofluorocarbon (HFC) refrigerants. Believed to be the largest seizure of its kind in Europe, the 24,459kg shipment from Ukraine included cylinders of R-134a, R-404A and R-410A and is estimated to be worth about €600,000. Tax Administration Chamber officers, in Łódź, discovered the HFCs during customs clearance of two consignments. HFCs are a family of synthetic chemicals hundreds to thousands of times more potent than carbon dioxide and commonly used in refrigeration, air-conditioning, fire protection, aerosols and foams. World-leading EU legislation in place since 2015 is gradually reducing the amounts that can legally be placed on the market. Clare Perry, our Climate Campaigns Leader, said: “This is the visible tip of the iceberg of what is becoming a major problem for the EU. “The swiftly increasing illegal trade in HFC refrigerants is seriously undermining the EU’s attempts to phase down HFC use under its revised F-gas Regulation as part of its strategy to tackle climate change. • On Tuesday, we will release a new report, Doors Wide Open, exposing the scale and extent of illegal HFC trade into Europe – watch this space!